There are some moments in pop cultural life, whether good or bad, that are pretty much iconic. I think everyone remembers where they were when Kanye West interrupted Taylor Swift at the 2009 VMAs to declare (rightfully, though done in the wrong way) that Beyoncé's "Single Ladies (Put A Ring On It)" was the greatest music video of all time. So, when it was announced that Kanye would have four minutes during the 2016 VMAs to do whatever he wanted, everyone wanted to know how the notoriously verbose rapper would spend that time. Between the release of his last album, The Life of Pablo, some truly bizarre Twitter rants, and his wife Kim Kardashian slaying Swift with the release of irrefutable proof that she knew about "Famous" before it came out, there were a lot of directions that Kanye could have gone. Ultimately, he decided to... just talk to the audience. And the things that he said were surprisingly — or maybe unsurprisingly — wise. Yes, that's right. 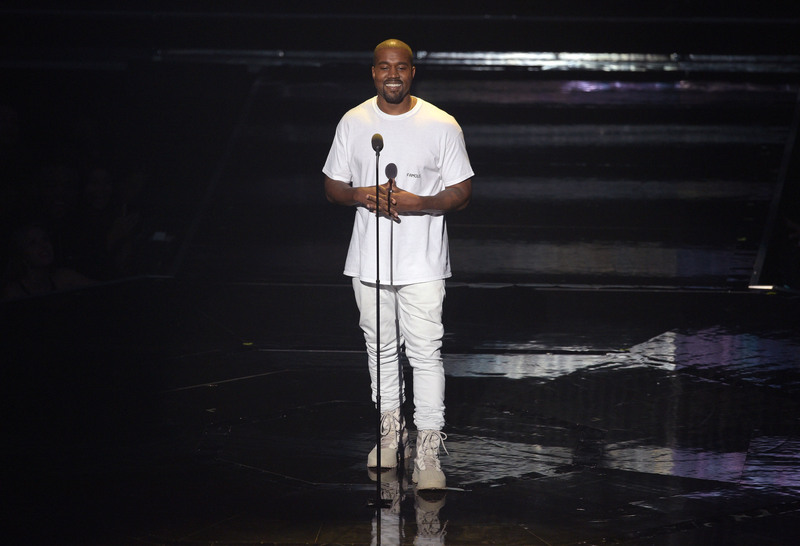 During the four minutes that Kanye had the stage to himself to introduce the "Fade" video, he decided to entertain the audience by making a four-minute speech. If you were waiting for him to take the chance to decimate Taylor Swift, then you're probably disappointed right about now. But I think Kanye did the best thing that he could have done with that time. Why? Well, because instead of tearing someone down, he decided to build people up instead. One thing in particular he said really stuck with me. He talked about the recent surge of homicides in his hometown of Chicago, and recalled speaking with a kid at the Art Institute in 2015 who told him "Three of my friends died and I don't know if I'm going to be the next." In response to that, Kanye recalled some wise words he'd gotten from a friend: "Three keys to keeping people impoverished: That's taking away their steam, taking away their resources, and taking away their role models." And those role models don't have to be parents or politicians or doctors. Those role models can be the very actors and musicians who are filling Madison Square Garden tonight. Those role models can be artists like Kanye West. And the fact of the matter is that Kanye isn't wrong. Long-winded? Yes. Rambling? Yes. But wrong? No. This is exactly why I spend so much of my time calling for more representation in media, and exactly why women like Beyoncé, like Nicki Minaj, and like Rihanna mean so much to me despite their immense differences. Because when a group of people have no role models — no one they can look up to who looks like them and does what they want to dare to dream the world will let them do — then they don't lift their eyes any higher than their circumstances. They don't dare to dream, and, in that way, they're impoverished in their souls, if not in their real lives. Leave it to Kanye West to cut right to the heart of that in his speech, naming more than a few role models of his own. The most notable thing to me was that, of all of the role models Kanye named, only one of them was black: Langston Hughes. Well, two, if you include the fact that Kanye put himself on the list. He looks to the artists and the merchants throughout history, but only one of those artists and merchants that he looked to was black like him. And that, to me, is an interesting commentary on the nature of history itself; for me, personally, I went to a predominantly white high school and didn't learn exactly how much black people have accomplished throughout history until I went looking for heroes that looked like me. If you give history a casual glance, you might think that people of color hadn't accomplished anything or even existed before the Civil Rights Movement in America, and I feel like Kanye touched on that with this speech and his list of role models. When some were expecting Kanye to spend his time at the mic causing drama, instead he called on the crowd to stop caring about petty things and to work together to affect change, to rise up, and to be role models to today's youth.